Another Miami Bicycle Accident has taken the life of a 25 year old man. Captain Ignatius Carroll, of Miami Fire Rescue, informed news agencies that on Monday, April 21, 2015 at approximately 11pm a motor vehicle was driving on the Julie Tuttle Causeway when it struck a cyclist. The driver of the car stated that she swerved to avoid hitting a vehicle that cut her off and, as a consequence, struck the bicycle. 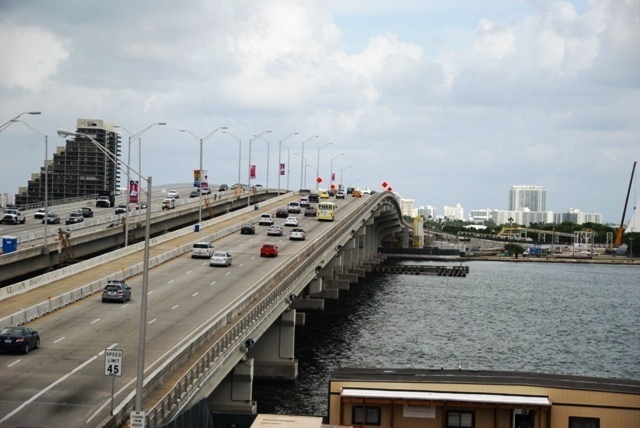 The bicyclist was thrown over the bridge into Biscayne Bay – approximately 50 feet below. When Miami Fire Rescue arrived on the scene, some of the bicyclist personal property was on the road but it took several hours for rescuers to find his body in the Bay. This tragedy follows a rash of deadly bicycle related deaths occurring in South Florida over the past few years – most notably were the ones on Key Biscayne. Key Biscayne is a popular cyclist location during most weekends and during early hours during weekdays. We have built special lanes on our interstate highways with barriers to “protect” what was once a carpool lane and has now become a revenue driven “I-95 express lanes”. Unless drivers quickly become more cognizant of cyclists on the roads that are supposed to be shared, similar protections similar protections need to be afforded to those on bicycles. Our thoughts go out to the family of the cyclist. Author’s Bio: Jeffrey S. Altman of The Altman Law Firm is a Miami Personal Injury Lawyer with whose main office is located in North Miami on Biscayne Boulevard at 108th Street. The Law Firm handles all accidents, including Bicycle Accidents, that result in Catastrophic Injury Cases, Traumatic Brain Injury Cases and Wrongful Death Cases throughout the State of Florida. Our office is centrally located between Aventura, Sunny Isles Beach, North Miami, North Miami Beach, South Beach and Miami Shores. If you need to discuss a case, please call Mr. Altman at 305.373.3730.